Dell has always released value-for-money machines, but its laptop range has never been the most attractive of options. Even the XPS has been more utilitarian than other gaming machines. Until now that is, as the Dell XPS M1330 (£1219 inc. VAT) has been designed to not only accommodate the latest technology, but is also the most stylish Dell laptop to date. The base system is made from brushed magnesium-alloy with a high-gloss black trim and you can choose from a range of eight coloured lids to add a hint of personalisation to your laptop. Dell claims this laptop is the thinnest 13.3-inch laptop on the market with a depth of 24mm. However, this is only the front edge, as the design is tapered, with the back of the laptop measuring 36mm in depth. This does mean there is room for an optical drive though, which is slot loading. Open the lid and you'll find a 13.3-inch Super-TFT panel that gives the machine its name. Using LED backlit technology, the panel is thin, but with plenty of padding to the lid, there is very little flex. The screen has a 500nit rating, making it twice as bright as the average laptop panel and this really shows when running presentations or playing a game. It also means that when out and about, you can avoid the screen looking washed out by ramping the power up so it looks bright and clear. Weighing in at 2.1kg, this is a lightweight laptop that is ideal for the daily commute. Furthermore, with a battery life, under test, of 258 minutes, it more than lived up to expectations, delivering over four hours from a single charge. However, it is the performance Dell has packed into this machine that really makes it a compelling choice. 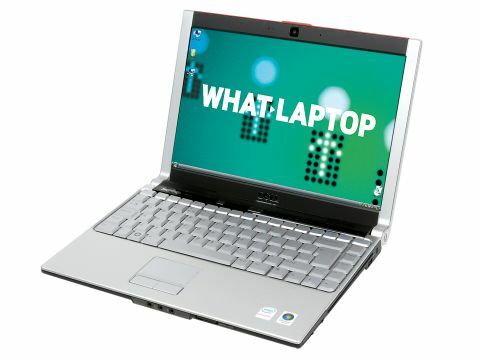 This may be a slimline laptop, but it isn't thin on power. Powered by an Intel 2GHz Core 2 Duo T7300 and supported by 2048MB of memory, this is as powerful a machine as you're ever likely to need on the move. What's more, with 160GB of storage space, you can store all your files and applications with ease. In use, we found the M1330 handled well, never noticeably slowing down, even when running multiple applications. Thanks to a dedicated graphics card, even multimedia is impressive. Dell isn't claiming this laptop is a gaming machine, but the use of the Nvidia GeForce 8400M GS means you can play the latest games at a respectable frame rate. We were also impressed with how cool the system remained, even after long periods. The Dell XPS M1330 more than lives up to expectations, making this one of the most desirable and user-friendly lightweight laptops around.